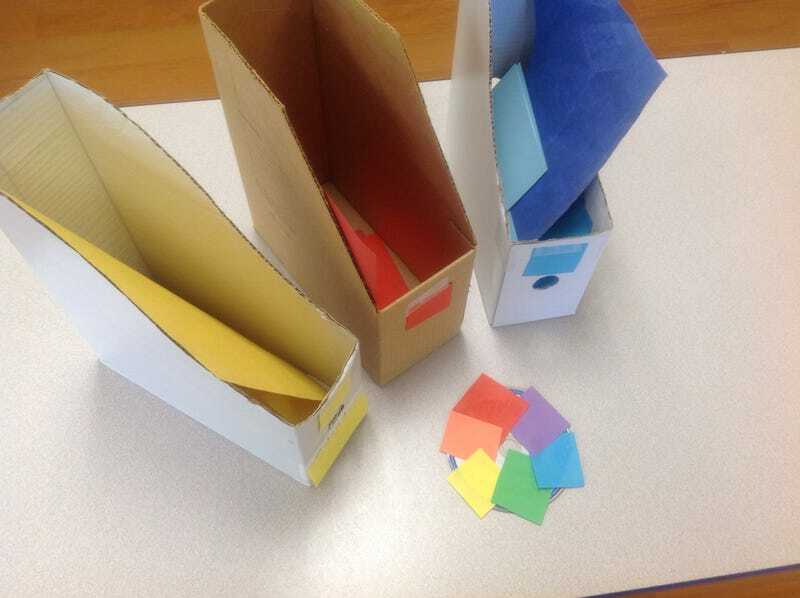 Exercise: We had been given loads of construction paper but it was all messy, and trying to get the kids to make a color wheel had failed because we couldn't get to step one: get one piece of every color. So this day, we had been given file folders and old CDs, so we want to make a color wheel. Some of the girls were super excited about making a rainbow and making it prettier than my example. I know all the kids have the skills, but the tiny scissors were back in another classroom and it was too late to track them down without inconveniencing another teacher. So we sorted all the construction paper and many of the kids bailed, playing with toys on the carpet instead. So even though I personally thought it looked appealing, I did not state our first objective clearly enough. Communication! It is going to be needing improvement on my end. Then one if the kids who was most stubborn about not participating was the first to brag to his mom about the project he did not do, so I promised we would continue on Monday. This weekend I need to make a curriculum for the next month, which seems daunting. Anyone have any resources, book titles, templates? here are my before photos, no photos of the kids for obvious reasons.